- Publisher SPRING'S GENTLE PROMISEI can't believe it. Grandpa and Uncle Charlie signed all the official papers and now the farm is mine--really and legally mine. Joshua Chadwick Jones they read, clear as can be. I couldn't be more thrilled. I mean, what other fella my age has a farm all his own, title clear and paid for? If the crop fetches a good price, I might even be able to buy one of them new Ford motorcars! And then there's this other thing going on inside me. I've been feelin' a desire for a family of my own. I still don't know how they finagled it, but Grandpa and Uncle Charlie got two gals my age livin' at our house--Mary, our housekeeper and cook, and Matilda, the schoolteacher. I've always thought of the girls as friends, but something in my heart is changing a bit. Is one of them the gal God has in mind for me? 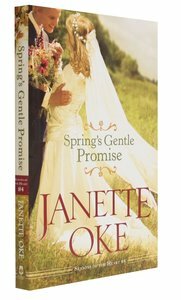 About "Spring's Gentle Promise (#04 in Seasons Of The Heart Series)"
SPRING'S GENTLE PROMISEI can't believe it. Grandpa and Uncle Charlie signed all the official papers and now the farm is mine--really and legally mine. Joshua Chadwick Jones they read, clear as can be. I couldn't be more thrilled. I mean, what other fella my age has a farm all his own, title clear and paid for? If the crop fetches a good price, I might even be able to buy one of them new Ford motorcars! And then there's this other thing going on inside me. I've been feelin' a desire for a family of my own. I still don't know how they finagled it, but Grandpa and Uncle Charlie got two gals my age livin' at our house--Mary, our housekeeper and cook, and Matilda, the schoolteacher. I've always thought of the girls as friends, but something in my heart is changing a bit. Is one of them the gal God has in mind for me?